The last couple of days the weather has been extreme at the Costa Blanca with heavy rains and strong winds. Rivers floated, schools were closed on Monday as well as many roads. Xabia or Javea registered 150 litres per m2 in 4 days, this is what normally would fall in half a year time. 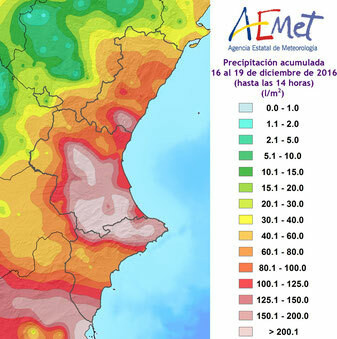 In the Alicante and Valencia provinces many damages were reported caused by the rain and wind. MMC Property Services makes sure to prepare you villa or apartment when this kind of heavy weather is expected, e.g. place all outside furniture inside, make sure windows and shutters are closed well and checks your home afterwards for any damages, water that may have entered your property and we put everything back in place. Whenever possible we can also go by your house during the heavy rain fall to keep you up to date of the status of your property and we will send you pictures, that way you can see for yourself. All these services are included in our monthly packages for our property owners. Want to know more? Don't hesitate to contact us!